When God called on Noah to protect all creatures, Noah had no choice which creatures to load on board. All of creation belongs to God, and Noah was merely caretaker. Like Noah, we have a moral responsibility to safeguard God's creatures from irreparable harm from the dangers they face today. Too many parts of God's creation teeter on the verge of extinction, and one in five species are threatened. Ecclesiastes 3:19 says that the fate of the animals and the fate of humans are intertwined and we both share the same breath. We know not what we do when we allow species to disappear from the earth forever. Let us not undo God’s handiwork. 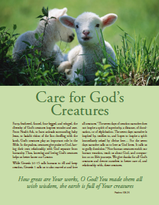 This resource equips Christians to pray, learn, teach, and preach about care for God's creatures. It covers topics such as dominion theology, biomimicry and ecosystem services. It also includes action ideas such as planning a Bio Blitz. Download it. In the United States, the Endangered Species Act has served as the “Noah’s ark” of our time, ensuring protection for creatures in peril. The ark in the Genesis flood narrative is how, God “remembers” (i.e., holds, keeps, protects, cares for) “all the wild animals and all the domestic animals” (Gen. 8:1). Today, we are called to be mindful of all creatures, and to take stock of their presence. The Endangered Species Act has a long track record of success. More than 95% of species that have been listed as endangered made a recovery.